The Bouyei (also spelled Puyi, Buyei and Buyi; self called: Buxqyaix [puʔjai], or "Puzhong", "Burao", "Puman"; Chinese: 布依族; Pinyin: Bùyīzú; Vietnamese: người Bố Y) are an ethnic group living in southern mainland China. Numbering 2.5 million, they are the 11th largest of the 56 ethnic groups officially recognized by the People's Republic of China. Some Bouyei also live in Vietnam, where they are one of that nation's 54 officially recognized ethnic groups. Despite the Chinese considering them a separate group, they consider themselves Zhuang (Tai peoples). 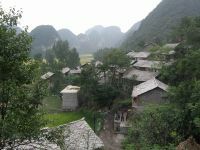 The Bouyei live in semi-tropical, high-altitude forests of Guizhou province, as well as in Yunnan and Sichuan provinces, and speak a Tai language. The Bouyei consist of various subgroups. Below are their autonyms written in the International Phonetic Alphabet with numerical Chao tones. In Congjiang County, Guizhou, there is a group that refer to themselves as "Buyeyi 布也益", but are officially classified by the Chinese government as ethnic Zhuang. 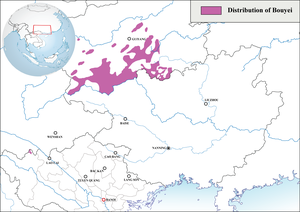 The Bouyei speak the Bouyei language, which is very close to Standard Zhuang language. There is a dialect continuum between these two. The Bouyei language has its own written form which was created by linguists in the 1950s based on the Latin alphabet and with spelling conventions similar for the Pinyin system that had been devised to romanise Mandarin Chinese. The Bouyei are the native Tai peoples of the plains of Guizhou. They are one of the oldest peoples of China, living in the area for more than 2,000 years. Prior to the establishment of the Tang dynasty, the Bouyei and Zhuang were linked together; the differences between both ethnic groups grew greater and from year 900 already they were two different groups. The Qing dynasty abolished the system of local heads and commanded in its place to officials of the army which caused a change in the local economy; from then on, the land was in the hands of a few landowners, which caused the population to revolt. During the Nanlong Rebellion of 1797, the Bouyei underwent a strong repression that caused many of them to emigrate to faraway Vietnam. ^ "The 2009 Vietnam Population and Housing Census: Completed Results". General Statistics Office of Vietnam: Central Population and Housing Census Steering Committee. June 2010. p. 135. Archived from the original on 18 October 2013. Retrieved 26 November 2013. ^ 贵州"六山六水"民族调查资料选编. 回族, 白族, 瑤族, 壮族, 畲族, 毛南族, 仫佬族, 满族, 羌族卷 (2008:291). 贵州民族出版社. Wú Qǐlù 吴启禄: Bùyī-Hàn cídiǎn 布依汉词典 (Bouyei–Chinese dictionary; Beijing, Mínzú chūbǎnshè 民族出版社 2002), ISBN 7-105-04965-0. Wikimedia Commons has media related to Buyei.